it looks like the best route is going from Harbor Drive around Petco Park to national drive to Euclid? How are the roads(potholes/road debris)? Elevation seems pretty flat. I'll be leaving around 6am and heading home around 6pm (I have head/tail lights)? Any areas of concerns as far as shady neighborhoods? I've also considered a half commute? Parking halfway and biking the rest? I agree with Petteri, go multi-modal with your folder on days you don't feel like riding all the way or because of time constraints. (With all the stops downtown, it might be faster to ride Harbor Drive!) City of San Diego ends at Division Street where National City begins. There might be some confusion with the numbered streets around this area (i.e. 40th ST in SD; 2nd St in National City.) National City's southern border is City of Chula Vista at the Sweetwater River (Hwy 54). Numbered Streets change again. You can ride a relatively flat Harbor Drive (becoming Bayshore Bikeway) south, turn east for slight uphills to either destination hospital. Harbor Drive has newish bikeways with more coming. It's a good solution for north/south bike commuters. The SD MTS Trolley parallels Harbor Drive so the same slight uphill from stations will be encountered. Going north in the evenings might present you with a headwind, stronger in spring and summer. Pick up the MTS Blue Line Trolley at America Plaza Station and ride to either 8th Street Station for Paradise Valley Hospital or H Street for Sharp Rees-Stealy Chula Vista. Both Hospitals are a short, slightly uphill bike ride from the associated trolley stops. Easy peasy! It might be that the employers offer discounted transit passes and/or showers, lockers and storage facilities for active commuters. Sharp has a very good reputation for cardiac care and I'm guessing it would promote, encourage and provide facilities for active commuters and aerobic exercise for it's staff. Riding from Paradise Valley Hospital to Sharp in Chula Vista might be easy via Highland Ave in National City becoming 4th Ave in Chula Vista. I wouldn't bother with driving half way and biking the rest. It just doesn't seem worth the effort and doesn't do anything to reduce traffic, pollution, noise and of course the parking hassles/security. Put the effort into multi-modal or bike commute. If you must drive on certain days, just go the whole way. All or nothing! Little Italy is a cool neighborhood, close to trolley stations and Pacific Hwy or Harbor Dr. If you locate elsewhere, MTS buses with racks handle bikes and folders are allowed on board. Multi-modal options via bus/trolley are easy to work out. Bike share might be a clever resource as well for the first mile/last mile to trolley or bus stops. Good luck. Thanks both for your suggestions. The Brompton's a folder so I've had no issues taking it w/ me on metros or buses when I visited San Francisco. Using a Trolley or bus seems like a great idea! Paradise Valley Hospital from corner of 4th Ave and Euclid Ave. looking southwest. 8th Street and Euclid Ave do not seem to have bike lanes the way 4th Street does. 4th Street seems to be the best bet coming up from Harbor Drive or the trolley station. National City has done well with their updates to bike infrastructure. I haven't ridden 4th Street but from Google Street View it looks okay. Well marked bike lanes separated from right turn lanes and bike boxes to boot. Very nice. From Trolley Station, go east on 8th Street under HWY-5 to Roosevelt Ave and turn north (left). Use bike lanes going north to 4th Avenue and turn east (right) again. Solid bike lanes all the way up 4th Street to the Paradise Valley Hospital. Green bike lanes through conflict zone at 8th Street and HWY-5 off ramps. No bike lanes on H Street in Chula Vista but wide road with two lanes and no parking along street so vehicles can pass easily. Hi, so I've done a few practice commutes on the weekends. 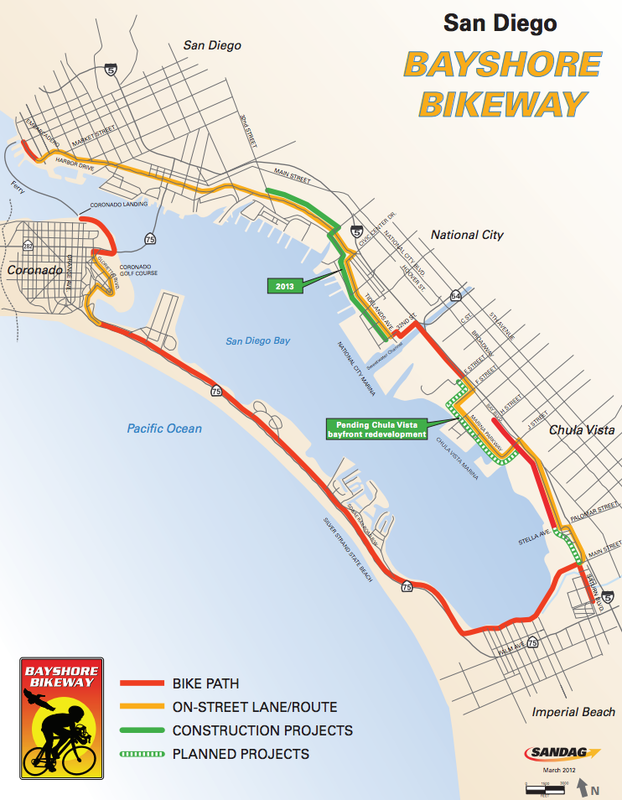 My question is when returning from national city to downtown SD, the bike path on Harbor dr, disappears around 32nd st.
On the weekend, it wasn't too bad riding on Harbor dr and while there was some relatively highspeed traffic, I felt safe taking the lane and letting them zip around me. I'm not sure how well that's going to work during a weekda/5pm rush hour traffic? should I cross to the other side of the road and ride on the bikepath against traffic? I've also gone meandering through 32nd to main to National ave and somehow turned into park/14th st! Same thing it wasn't bad over the weekend, but I wonder if it's good during rush hour? The other option, I see on the map but haven't tried is going up Euclid to Market. Hiya. The protected bike path on northbound Harbor Dr does end at 32nd, but there is a bike lane continuing north after that. I would not salmon against traffic on the southbound side, especially during rush hours. I'd suggest you get out of that northbound bike path early as you approach the 32nd street intersection, and control the right traffic lane until you get past the intersection. Traffic goes slow enough during rush hours that that shouldn't be difficult. Then once past the pedestrian bridges, you can get off onto the bike lane. Personally, I prefer using 32nd St over Euclid and Market. That's a more trafficky route (more cars, and at faster speed). I would defer to Smorg and others for their first hand knowledge of the best routes. I don't ride much anymore and haven't ridden the routes you're talking about. #1) I was going to suggest (assuming start at Paradise Valley Hospital) Euclid to Imperial Ave (seems to have okay bike lanes) to 32nd to Broadway, but that's really without much firsthand knowledge. It seems to share the same problems as Euclid to Market. MTS 929 Bus is an option as well as the trolley BLUE LINE. It runs up Main Street toward the 12th and Imperial Transit Center. Good Plan-B for dark, rainy commutes. Get your employer to cover a monthly transit pass. #3) Ride bike (or MTS 3 or 13 Bus) north (bit of a hill) to Trolley ORANGE LINE near Euclid and Market going toward the 12th and Imperial Transit Center. Another Plan-B for dark, rainy commutes. I'll leave it to more informed riders to advise. Good luck.